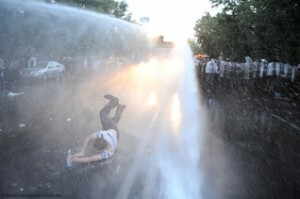 A report published today by International Partnership for Human Rights (IPHR) documents the crackdown on the peaceful protest dubbed “Electric Yerevan” in the capital of Armenia on 23 June 2015. The report summarizes the findings of a fact-finding mission organized by IPHR in the framework of the Civic Solidarity Platform (CSP), a regional network of human rights NGOs, on 24-29 June 2015. Following days of protests in Yerevan and other Armenian cities against plans to increase electricity prices, police moved to break up a peaceful demonstration held at Marshal Baghramyan Avenue in the capital in the morning of 23 June 2015. As documented by the CSP fact-finding mission, after giving protesters little warning of the pending dispersal, police used water cannon against the protesters, turning up the pressure to the point where people were knocked off their feet and left with injuries to their eyes, ears and other parts of their bodies. Over 200 people were detained and many of them were allegedly chased, hit, beaten, kicked and/or put in choke-hold by police. Testimonies obtained by the CSP fact-finding mission, as well as available video footage show that plainclothes police officers took an active part in the detention and ill-treatment of protesters. These officers wore only “police” armbands, which they often put on or unveiled only shortly before the dispersal of the protest started. The CSP mission also documented a number of cases where police targeted journalists who covered the protest, detaining and physically assaulting them and confiscating, damaging or destroying their equipment, thereby obstructing them from carrying out their work. In some cases, the ill-treatment of apprehended individuals allegedly continued in police cars as detainees were being taken to different police stations in the capital and neighbouring towns. In Other cases, senior police officers present allegedly failed to intervene to stop police abuse, or allegedly instructed lower-level officers to treat journalists harshly. The CSP mission was able to confirm that dozens of people sustained injuries as a result of the use of water cannon and the heavy-handed tactics of police. The CSP fact-finding mission also documented concerns with respect to the access to legal safeguards of individuals who were detained by police. Apprehended individuals were often not properly informed about the grounds for their detention or their status and rights. In many cases, they were treated as suspects and searched, fingerprinted and/or sent for alcohol and drug tests, although they were supposedly held as witnesses. Detainees were also not always granted prompt access to a lawyer and in some cases police allegedly obstructed access to legal assistance, e.g. by preventing lawyers from seeing their clients for a long time. The CSP delegation recorded several cases when individuals were threatened with repercussions – including by being criminally charged – unless they agreed to take blood tests or comply with other requests made by police. The mission members also received reports about a number of cases where authorities failed to ensure prompt access to medical assistance and adequate treatment in detention, e.g. by leaving detainees without anything to eat for hours on end. While some detainees were held for as many as nine hours and more, all those detained in connection with the dispersal of the demonstration were eventually released without charge by the evening of 23 June. However, the same day, the Prosecutor General’s Office announced that it had opened a criminal case on “hooliganism” in relation to the protest actions that preceded the dispersal. An investigation is currently under way. In another development, the Armenian Special Investigation Service announced on 3 July that it had initiated a criminal investigation relating to allegations that law enforcement officials exceeded their powers and obstructed the activities of journalists during the events of 23 June. Based on an assessment of relevant provisions of national and international law, this report concludes that Armenian authorities violated the right to freedom of assembly by forcibly dispersing the peaceful protest held in Yerevan on 23 June, although it posed no clear threat to public security or the rights and freedoms of others. The CSP mission members found no evidence that some protesters threw stones at police, as reported by media with reference to police sources, without providing any details. Some interviewees said they saw a few plastic bottles flying towards the water cannon after the dispersal of the protest had started, but all demonstrators, journalists and civil society monitors with whom the CSP mission spoke described the protest as inherently peaceful in nature, as also corroborated by available video footage. In the event that isolated participants would in fact have thrown some objects at police, any police intervention should have been aimed at dealing with those particular individuals rather than dispersing the whole event. Moreover, even if the authorities did not receive formal notice of the protest actions on 22-23 June and these continued for a longer period than that foreseen for spontaneous assemblies under national law, these circumstances did not in themselves justify forcibly dispersing the event. The report also finds that police acted in violation of international human rights standards on 23 June by using disproportionate and excessive force to break up the protest as well as ill-treatment against protesters and journalists, as evidenced by the numerous injuries sustained by victims. The information presented in the report raises serious questions regarding the nature of the detentions that were carried out and suggests that many protesters were arbitrarily detained and that their rights as detainees were violated. The report is being presented today in Brussels at an event entitled “Electric Yerevan: Lessons for Freedom of Assembly and Civic Culture in Armenia”, which is co-organized by IPHR and the Open Society European Policy Institute. The report “#ElectricYerevan: Crackdown on Peaceful Protest in Armenia” is available here. Next articleKazakhstan: Clear lawyer of criminal defamation charges!